Description: Men’s Puma Fleece Tracksuit. Features the Puma logo on the top and pants. Also has a full zip hooded top. Description: Men’s Adidas ‘Back 2 Basics 3S’ track suit. Features an Adidas logo and three stripes down each side. Also includes side pockets on the top and bottoms. Pants are regular length. 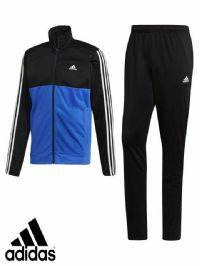 Description: Men’s Adidas ‘Back 2 Basics 3S’ track suit. Features an Adidas logo and three stripes down each side. Also includes side pockets on the top and bottoms. Pants are short length. Description: Men's Puma fleece Tracksuit. Features the Puma logo on the chest and pants. Also has open pockets on the pants and top. Navy colour with an white stripe on the shoulders. Description: Men's Puma fleece Tracksuit. Features the Puma logo on the chest and pants. Also has open pockets on the pants and top. Description: Men’s Puma ‘Mix Tricot’ track suit. Features a Puma logo and two side pockets on the track top and bottoms.